Your guide to taking care of your body and all the aches and pains that come with it. Why You’re Here: Your body hurts and you want to take better care of yourself. 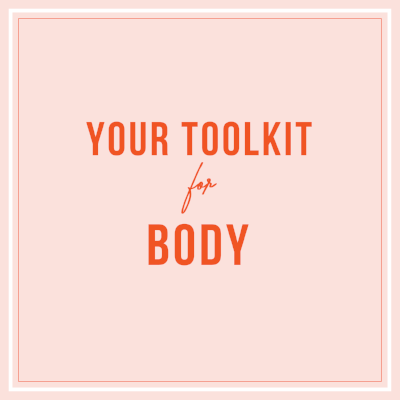 What’s Inside: Consider this Toolkit your starting point to taking big or baby steps to improving your overall health and caring for your aches and pains. How To Use It: This isn’t a prescription, so feel free to take or leave the ideas we share depending on what your body tells you and which habits fit your lifestyle. View your body as more than just this thing that carries you around; notice when it tells you something. Our body needs us to take care of it if we're going to require so much from it. It's not a simple problem to care for the aches and pains, but perhaps combining a few simple changes can create a solution. There could be other reasons you’re experiencing aches and pains. Your pain might be signaling something else happening in your body depending on your recent activity level. For example, you could have sore muscles a day or two following a workout. Often, that’s your body signaling that it’s time to relax, not over-train, while it heals itself, Samantha Clayton, ACE- and AFAA-certified personal trainer, Olympic sprinter, and women’s sprints coach at Pepperdine University in Malibu, Calif. tells Everyday Health. Other common factors for day-to-day aches and pains include symptoms to other conditions, including lack of sleep, stress, dehydration, anemia, cold or flu, Vitamin D deficiency, mononucleosis, pneumonia, chronic fatigue syndrome, fibromyalgia, arthritis, lupus, lyme disease, multiple sclerosis and histoplasmosis, according to Healthline. Take a bath with epsom salts. Do basic stretching to ease the tension of sore muscles. Find a good foam roller. Look up some simple yoga poses. Take a closer look at your work set-up and go ergonomic. Set a reminder to repeat your stretches every morning. Research some options for other ways to care for your body —perhaps an essential oil blend that boosts energy or soothes tension headaches, keeping a supply of Tiger Balm patches on hand, or even creating a detox bath regimen. Take an hour to dig around online for the tools you need to stay in alignment. Listen to your body as soon as it's talking to you - and have resources ready for those moments. Know your preferred physical therapist, chiropractor, acupuncturist or other healer for the next time your lower back decides to remind you it's in pain. Stock up on essential oils, pain patches, and the best bath bubbles. Don't ignore the small signs that something might need to be tended to. This could also be a sign of chronic pain, so it’s important to talk to your doctor about that. How do I manage stress so my back/neck don't hurt all of the time? Your stress is connected to your potential back and neck pain. It’s important to first address the stress and come up with ways to improve your back and neck aches. To manage it, get up from your desk more often, moving every 30 minutes for about 1 to 3 minutes. Breathe, work on taking in a big breath. Move your head and chest, arch your chest forward and move your head up looking at the ceiling. Check out your desk set-up. Is your eye in line with your computer? Are your elbows at a 90 degree angle? Make ergonomic adjustments as well as taking action to reduce your stress and back pain. Tips for dealing with chronic pain while working a desk job? Give yourself plenty of time to get to work and get ready each day. Start your day off with stretching, moving and doing things that you enjoy. Try to budget your energy so you don’t feel overwhelmed. Get plenty of rest. Make time to laugh and cry. Find your limits and how you can recover on painful days without digging into your off days. Focus on balance, gentle exercise with exercises such as walking, swimming, yoga, tai chi, pilates or other low impact forms of movement and strength training, according to Mayo Clinic. What can I do to deal with my desk related back pain? You don’t want “office bod” — you know that slouchy desk position. Bad posture can contribute to headaches, neck, jaw, mid back, low back, shoulder and digestive issues. To change that, incorporate simple exercises and walks throughout your day. Take breaks. And when you’re off, try and break a sweat to keep your muscles lubricated. For the long term, make sure you have support at your office chair so that the back of your chair helps you sit upright. If you feel a gap between your back and lower back add a lumbar pillow for support and keep your legs rested flat on the floor. You want to make sure the weight of your leg is supported so that your back is not strained. A foot stool or cushion can also help aid in discomfort.